First we need to get qemu-img, a tool bundled with qemu (KVM's virtualization backend) to convert the VM disk to a raw image, and TKLPatch, the TurnKey customization mechanism to package the ISO. If you are not using a TurnKey installation, see the TKLPatch installation notes. I'll show how to convert a VMWare VMDK image into raw disk format. If you are using a different virtualization platform such as Virtualbox, see this post on converting a VDI to a raw image. Next, mount the raw disk as a loopback device. GOTCHA 1: If your VM has partitions, it's a little tricker. You'll need to setup the loop device, partition mappings and finally mount the rootfs partition. You will need kpartx to setup the mappings. Now, make a copy of the root filesystem and unmount the loopback. Because the VM is an installed system as opposed to the ISO, the file system table needs to be updated. GOTCHA 2: If your VM uses a kernel optimized for virtualization (like the one included in the TurnKey VM builds), you need to replace it with a generic kernel, and also remove vmware-tools if installed. Finally, prepare the cdroot and generate the ISO. Bonus: By default the ISO will boot automatically. If you want to include the TurnKey bootsplash and bootmenu, extract the cdroot from a TurnKey ISO and tell tklpatch-prepare-cdroot to use it as a template. Ever needed to package a VM as a distributable ISO? Post a comment! Thats excellent Alon, thanks a million! It wasn't easy was it?! I'm snowed under right now but I'm really looking forward to trying this out once I'm back in "iso mode". TKL just keeps on impressing me more all the time. Every once in a while it's fun to tackle an issue like this, so thanks for the inspiration. The gotcha's got me, so I assume they got others as well, which makes this post that much more interesting and useful. I am having a time with trying to get this to work. I have installed the core system, and all the programs, and continue to get the message (qemu-img: Could not open '/vtserver.icanreach.com/vtserver.icanreach.com-flat.vmdk'). I need some help. and remember that Linux is case sensitive. Eg /somefolder/somefile is different to /SomeFolder/SomeFile. Also makesure the machine is not running. I made sure of the file and directory, and results are the same. I'm completely lost at what the problem is? I don't know enough about this process to be of any more help to you. I'm in the midst of trying this and I just now slavishly followed the "GOTCHA 2" suggestion of replacing the VM-optimal kernel with a standard kernel. However if the ISO is going to be used exclusively for VMs, would it make sense to skip this step? The virtual kernel does not include squashfs support, so the resulting ISO won't be able to unpack the root filesystem, and the boot will fail. Also, an ISO can be installed to bare-metal, so it doesn't make much sense to include the optimized virtual kernel even if it was possible (to be complete, it is possible with a couple of workarounds but not worth the effort, and possible side-effects). Thanks so much for such interesting articles! - You install a GNU/linux OS at secondary (non bootable) partition on your windows box. ¿How to convert your secondary nonbootable linux partition to a virtual machine bootable disk??? I suppose (without thinking about it too much) that the process should be very similar, minus the VM conversion. I would be interested to know if you try this, and what the outcome is. Keep us updated. I had partial success with this -- I was able to create an ISO that worked perfectly as a "Live CD". I was able to run my appliance directly off the ISO. The configuration console magically included a new "Install to Disk" option. However when I tried this it got pretty far into the installation -- including seemingly copying the rootfs to the disk -- but then failed while trying to set up grub. But I'll leave that to another post -- I think even the creation of the "Live ISO" was a good start! (1) Alon mentioned that you may find you have multiple partitions on your source VMDK. In fact its probable that you will -- I certainly did on the Turnkey/Postgres-based VM I started with. However I was using another TKL-based VM as the "working machine" to run the commands on and I had trouble installing kpartx here. I switched to a Fedora host and was able to install kpartx ("yum install kpartx" iirc) and complete the rest of the procedure here. (the desired destination of resolv.conf is likely different on a non-TKL-based rootfs). Is it possible you were hit by GOTCHA 1, VM has partitions? Just throwing this out there. I used it on a server to create an ISO with all of the goodies I put on there. Never tried it on a virtual machine. Will try soon though. This is a great idea, this way it much easier to be hypervisor independent. If you wanna go for VMware, Citrix XenServer, Hyper V, it doesn't matter. Thanks for sharing. I stumbled across this when searching to convert my VM image to iso. Have not been able to convert a tib to iso yet. This process is quiet complex and lengthy too. Is there any other easier method? I tried it and halfway through system got rebooted and lost all conversion I did. I had trouble mounting the secondary drive. And is there any preferable location to copy out the root file system. My operating system is windows 7 but the specification of my system is very low, running out of free space. Should I try again, is there any chance of crashing my system and losing all information? Well, this is useful! I'm downloading a Chrome OS image (in vmdk format) and I need it on a DVD. 'Cuz I like to boot things on a physical machine. Not a virtual one. i guess this procedure doesnt work for windows vmdk? Do you know any way to perform this on such a vm? The procedure detailed in the post is for Linux based VMDK's, particularly TurnKey 2000.10 VMDKs. I'm not aware of a similar approach for windows based VMDK's. Note for future reference, the procedure will need tweaking on 11.1 VMDK's (soon to be released) as they use grub2 and LVM. thx Alon for the clarification. just for those who might google this page searching for the same solution as i am, there is a tool called "etboot" on the page reboot.pro. this tool is able to convert a flat vmdk into iso (apparently no sparse vmdk). I accidentally downloaded the VMWare version of BackTrack. VMWare doesn't let u access the wireless card, so bad for me. anyway, this step doesn't work for me.. I've tried evrything... PLZ HELP!!! The contents of the BT4R2 folder. Also, this folder is being used through VMWare shared folders. The procedure detailed is known to work with TurnKey 2009.10 VMDKs. I'd recommend you either download the ISO or contact the folks at backtrack for help. I tried this to convert .vmdk to .iso using qemu-img. My vmdk file is 1.7 GB and the resulting .raw is whoping 20 GB. Why is the raw file so big? And the TKL .vmdk is a sparse image. In other words the original HDD image contains only data (but can be up to 20GB) but the .raw file includes the empty space as well. Once you mount it and extract the filesystem you should be back to ~1.7GB. Maybe the .raw is 20GB because the .vmdk was created with 20GB virtual disk? I created a VM with 20GB virtual disk using VMware fusion with no splitting option and installed linux core and base. I see that .vmdk is ~1.7GB and the following command produced linux.raw file which is 20GB. What I'm trying to achieve is to install my application and the dependencies in the VM and create an ISO image and distribue it to my customers. It's possible to distribute the virtual appliance in .vmdk itself but if I can distribute an ISO customer can install it on any hardware or any virtualization technologies. You only use the .raw file as an intermediate step so the fact that is 20GB shouldn't matter. In your useage scenario you may be better off using TKLPatch, to create a patch that you can apply to the default ISO (to recreate your custom appliance). Thanks. I have not explored TKLPatch yet. Is it possible to convert my 20GB .raw file an .iso under 4GB? Once you have created the .raw file you then mount it (like you would an .iso) and copy out the contents (which should only be ~1.7GB - ie your original data size). Your resulting .iso should be around that size too. If not then I would assume there is something funny/wrong going on. It was mentioned that changes were required to do this with version 11 based appliances. What needs to be done to make this process work with those? Now that I have a working iFolder appliance I'd like to make a cd of it so I don't have to compile the packages again. No sorry, got no idea. Perhaps you could try RemasterSys in the meantime? Although TBH I haven't used it with a server (but it's been quite useful for desktop use). PS Did you document your iFolder progress? It'd be great if you could share as I'd love to create an iFolder TKLPatch and then perhaps an official TKL iFolder appliance might be released. I posted a comment on the wiki page for the iFolder appliance about the steps i took to compile iFolder on version 11. If the compiled packages could be put in a repo somewhere then making a patch would be very easy. You would not have to wait for it to compile and you would not have to do all the cleanup (removing all the necessary packages, etc.). I will investigate further. When I get a chance I will look at perhaps uploading it to a PPA. I'll post if/when I get to that. The command VBoxManage filename.vdi newfile.iso --format RAW would not work for me. I have not been able to test the iso file that resulted yet. The iso file is about 6 times the size of the vdi file. That's why it's larger than your original VDI. And actually it's a RAW file (which is a raw harddrive image). If you follow the tutorial it is only halfway through the process. To complete it you need to mount the image you have created and copy out the files, then make an ISO of the files only (that doesn't include the free space). This should bring your ISO back down to a similar (or perhaps smaller) filesize as your original VDI. Everything moves along swell up until the last command.. Although must admit that the tutorial does include the trailing slash so not sure if that's it. Do I have to prepare the image on a turn-key distrobution for this to work? I am trying to prepare the image from an Ubuntu 10.4 installation.. Into a bootable ISO of the configured OS. Basically have to mount the RAW image with and offset of 512 to id the filesystem (ext2) properly. This will actually mount an image properly, so just modify it as the Gotcha above for partitions. I'm just stuck now, I don't know how to properly add both partitions to the image nor will the script run on the rootfs gleaned from one of the partitions. If anyone can help I would appreciate this. A quick scan of the second link you provided suggests that that particular version is a mishmash of 2 old versions of Debian but I couldn't quite work out what the go was with the new version. The fact that searching/scanning the website, forum and wiki resulted in no idea on what the OS is based on or what sort of licence it's under doesn't bode well (although perhaps I'm wrong). It seems quite closed and as such I'd suspect that the only way you will be able to do what you are hoping to is with the help and/or support of the makers/community. Have you posted on their forums? True regarding the opensource firewalls distros. Except I've been through ALL of THEM. :) Seriously, I'm running on Zentyal at my office at the moment, but I've been through Smoothwall, pfSense, ClarkConnect, IpCop, IPFire, etc etc etc. //disclaimer - I am not affiliated with Mikrotik in any way whatsoever. In fact, they would probably look down on what I am trying to do by creating a LiveCD. Mikrotik is absolutly the best of the best. Its a bit funky to get started with, ( I was actually planning on running pfSense before I read a single post from a random comment on the pfSense forums that said "Try Mikrotik, once you learn it, you will never go back." I spent last weekend learning it, and without a doubt, it frakking rocks. Just to get started, a web interface and windows interface for the firewall.. Why would you need the windows interface? Well, for starters, it allows you to connect to the firewall to reconfigure it regardless of your machines IP settings. It connects via MAC address, TCP/IP4 or TCP/IP6 as well as autoscans the local network so a freshly installed firewall is accessible without even touching the console. The 24 hour time limit on the demo is a bummer but you can backup your config, reformat , and reinstall your config to continue using it or learning it. As well as their licensing is confusing and a bit expensive for SOHO usage.. but considering you can buy some of the RouterBoards including the license for less than the licensing alone, I'm not sure where I stand on that. I highly reccomend it if you do any networking at all, or if you just want something fun to play with. AFAIK unless the original distro supports running live then this will not work for you to create a live distro. I'm sure creating a live version of the router OS is possible, but not without some serious hacking. The TKL devs have hacked the default Ubuntu Server OS so it can run live so unlike default Ubuntu Server TKL can run live already. I imagine you would need to do similar hacking first to allow this distro to run live. How you would actually go about that is well beyond me and may also be outside the terms of the Mikrotik licence. As you've possibly guessed from my previous posts I'm a strong advocate of the open source model. But I also try to be respectful of the relevant licencing. If you like Mikrotik RouterOS that much I suggest you consult with them on what your options are and what it will cost you to do what you want. qemu taking a long time -- is it working? I'm guessing that this conversion process could take a really long time. I'm waiting for the command "qemu-img convert -f vmdk Linux\ Mint.vmdk -O raw LinuxMint8Helena.raw" to finish executing. Should it really take so long? But if it's a big image, yes it will take a while. A good baseline timeframe to consider is how long would it take to copy the file? Then add a bit (depending on hardware). You can see if it's still doing something via a new terminal window. I don't remember the commands off the top of my head but if you google "check progress qemu-img convert commandline linux" or something similar. I haven't actually done it with qemu-img but I am assuming it would be similar to checking progress of dd. hi, im trying to mount a vmdk with installed Android-x86 distro. my goal is to modify system dir. Neither 'msdos', 'fat32' or 'ntfs' seem to be recognized. (yes, I'm doing this with a windows 7 image). vfat should be a recognised format and depending on what distro you are using, you may need to instal ntfs drivers before it will recognise NTFS FS. Regardless of that though, because of the nature of how Windows works, I don't think you'll have any joy using this method anyway. Even if you do manage to convert your VM to an ISO I imagine that you'll find that trying to run it on anything that doesn't closely resemble the virtual hardware of your VM will result in a BSOD. I'm guessing you are trying to create a Win7 ISO with preinstalled apps and/or customised config? I don't know enough about Win7 to give you any really good suggestions, but if you are looking to create a preconfigured image then the MS tool sysprep is probably your best bet and then create an image of your syspreped system. If you hunt about online I'm sure you'll find tons of info detailing the best course of action. Yeah, I wasn't sure if this would work for Windows, but was having trouble getting anything else to work so thought I'd give it a shot. I'll give sysprep a try! Thanks again for your quick and helpful response! Another afterthought may be vLite. AFAIK it is the successor to nLite which was a quite cool way of creating a customised XP install CD (vLite is for Vista & 7 IIRC). I have successfully been using a combination of sysprep and a FOG server to create and deploy Win7 images to multiple machines. It may be overkill (or simply not suitable) for your purposes but it works really well for mine! Possibly worth a look...? After this I get an error about syslinux not being found... Any suggestions? But when I loaded it to virtualbox, The system did not booted. I got a "kernel panic" message. Just want to say that this blog contains what often we're looking for and can't find simply by ignorance of those who know and have NO desire to explain to these who learning. NOT In here !! Not sure, if you received my last post. Could you assist in this matter ? WARNING: GPT (GUID Partition Table) detected on 'fedora-security.raw'! The util fdisk doesn't support GPT. Use GNU Parted. And dmesg just shows how it tries all types without success. Do you by chance know how to deal with this? And if not (but still something Linux) it should be possible, although to be honest I have no idea how you would go about that. I would suggest that you post on the forums/mailing list for whatever distro you're using and ask there. That way hopefully you will get some answers relevant to your scenario. I've been searching for days trying to figure out how to do this. This is the only walk-through that worked on the first try. Mad Propz!! We run a highly virtulized dynamic environment. Even our DNS servers are virtulized. When we have a catastrophic event and have to spin everything up from scratch our VM hosts cant find their back end storage because DNS is down becuase the VM Host cant find its back end storage ..... so I want a bootable ISO of our DNS server, even if I have to tweak some of the entries because they have changed Its still better than what I currently have to do which involves remounting storage devices as an IP bringing up DNS then bringing up a clone on another host and downing the first copy. Its quite time consuming and surprisingly we seem to have several catastrophic events a year. I think it means he can't find dpkg in the chroot environnment, but i got no idea how to fix this, if you have one i'd be glad to hear it. PS : I'm trying to convert the metasploitable vmdk to an iso. I use a program called remastersys if your looking at creating bootable OS from working linux system. Allows live OS and install, and options to output config from services/applications so theres no mucking around after install. If was providing read only control on services I couldnt see why it wouldnt run all day live of a cd/dvd. Draw backs is I have only tested this with ubuntu (but most things linux can be tinkered and chaged to suit) and it wont like the iso if it is too big (but again I cant see why the size limitation cant be "forced" to ignore error). Although I haven't tried it on a server OS. Also I didn't realise that it was back up and running (IIRC it died some time ago, but obviously got revived somewhere along the line) so thanks for that info. i tried to create the an iso using remastersys, but i was not able to install from it. it was just a live cd. even the install option caused it to boot in live mode. cud u plz help what steps u had followed and which version of remastsys u had used ? Jeremy you seem to respond to posts so I've got a question/I need help with something. I have Oracle VM, I have installed ubuntu server 12.10, xfce, other essentials, webmin, samda and basically got it at the stage I'd like to clone it. The original reason I used VM was because I'm looking to covert and old laptop into a server. I'm waiting on an sdhc card and sd card reader in the post si I can install from usb. I was originally looking at clonezilla but in oracle vm you can't seem to select a physical disc as a sata controller (only virtual). If I format the laptop with XP in it, how would i go about cloning my .vdi image onto the usb and then onto the laptop? I decided to create a live cd. Install ubuntu server, use gpparted, then copy copy and mount ext4. Thanks a lot for sharing your great and informative article. Since I took part in a Workshop regarding to VMware, I work with it. I made good experiences and hope to expand my knowledge in this case. So thanks again and all the best! I followed the steps, and got all the way to the iso, but it doesn't boot properly. 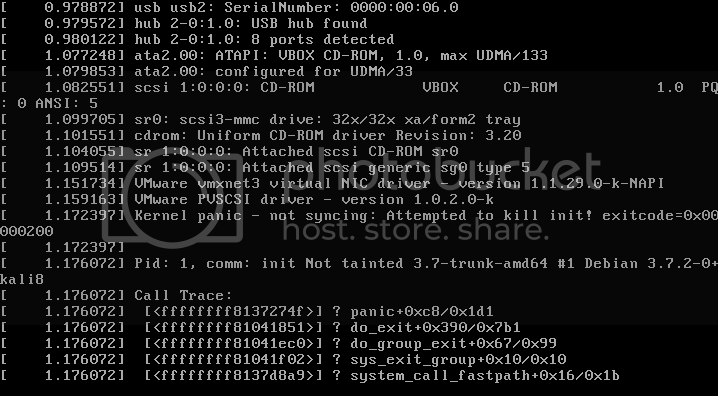 In the boot process it gets to the step where it starts a vmxnet NIC driver, then kernel panics. I suspect I somehow need to uninstall it at the .rootfs stage, and replace it with something else. I am not sure how I can do this, any ideas? Error , two partititions, /boot and /dev/mapper. I suspect the issue is that TKL now uses LVM by default. Unfortunately I am not sure on a workaround. thanks a lot for this solution. Just to add a small bug in the procedure, i was getting error while creating the iso stating that the file size was larger than 2Gb so some flag "-allow-limited-size" had to be added. finally i create the iso and tried to install with it, but the it didnt work :( from the logs i cud just find that some kernel panic had happened and the whole thing just shut down. had anyone faced a similar issue. please help !! I got the below message after booting the ISO. I was able to follow the instructions and I encountered GOTCHA 1. I was not able to install the linux-image-generic after chroot 'ing so maybe that is my problem but if anyone experience this problem and fixed it then I would greatly appreciate the help!. Is the ISO image file created by this method installable or just bootable (live) ? What type of file system do I have to use to mount the RAW image? your offset number will be 2048*512 = 1048576, the place where the mount should begin!! Is the OS Debian or a derivative (e.g. Ubuntu)? Otherwise that's really weird! According to Debian dpkg-divert is provided by the dpkg package. It is a fundamental part of Debian (and it's derivative's) package management system and should certainly be installed! I've followed this process to the final step and have had success so far, however when I attempt to run tklpatch-geniso foo.cdroot I get: File foo.cdroot//casper/10root.squashfs is larger than 4GiB-1. -allow-limited-size was not specified. There is no way do represent this file size. Aborting. the cdroot directory is 22gig in size. I didn't see anything in this post that excludes large vms. Is there a work around to this? Did some digging and noticed that the tlkpatch-geniso utilizes the genisoimage command. That led me to this fix mkisofs -allow-limited-size -l -J -r -iso-level 3 -o <output.iso> foo.cdroot which should allow it to generate iso file larger then 4gb, running it now so heres hoping. We have too much confusion already, right ? how can i splve this, please kindly help me with that. These instructions are really old so may need some updating. IMO they could certainly be improved! Actually I just noticed that you are trying to mount /dev/mapper/loop0pl (lower case 'L') whereas it should be /dev/mapper/loop0p1 (number '1'). Perhaps that's your only issue?